In what was probably the lamest-looking Met injury since Mike Piazza ruptured a groin on an inside pitch in 2003, Ike Davis hit the disabled list today with what officials are calling an ankle sprain and bone bruise suffered while waiting for a pop fly to come down from the sky the other night. Couldn’t he have have gotten hurt diving into the stands or legging out a triple like a real jock? Whatever else is wrong with the Mets these days, Ike wasn’t ever part of the problem and his absence, even if it’s only for a few weeks, is going to hurt whatever expectations you had for the Mets. Fernando Martinez, who isn’t currently injured, was recalled to take his place and reportedly in Denver in his No. 26 jersey. In case you didn’t see it, revealing article by the incomparable Paul Lukas of ESPN today examining the tossed-off manner with which the Mets adopted the ugly black uniforms they’ve been wearing for 13 years now. By all means read the article but don’t let me spoil the secret that it was motivated by a combination of greed and Yankee paranoia, poorly thought through, and carelessly executed. Given the fact that the man seemingly most responsible for this debacle was arrested the other day and charged with stealing from his bosses — you can’t get away with that in Flushing anymore — and otherwise brought shame and disrepute to the organization given his alleged involvement in an illegal sports gambling operation, you’d think the Mets would move to distance themselves from the literal and figurative darkness the whole black jersey represents, but the Mets never learn. My friend and frequent MBTN contributor Paul the other day suggested he was rooting for Francisco Rodriguez’s option to kick in with the idea that it could represent the obligation that triggers the Wilpon’s ultimate financial ruin and forces them to the selling block and poorhouse. He wasn’t joking and I’m beginning to see the light myself. Frankie Rodriguez is a jerk and makes me ashamed to be a Mets fan, and if the Mets knew what’s best for them, they’d use this revolting incident as the opportunity it is to void that terrible contract he has and reassign the No. 75 jersey to a bush leaguer, not a guy who only acts like one. Mets would be on the hook for $29 million over the next two seasons for Rodriguez. Even if he didn’t beat people up every so often, that’s an awful lot for what’s essentially a luxury that’s barely made a difference in the security of leads. I’ve said it before, but Brand Name Closers are about the worst investment a team can make and Omar’s been burned on every one he’s chased so far. That Rodriguez is so far down the list of Omar’s mistakes is surely an indictment of his reign: So is the fact that the team hasn’t won two games in a row since late June, and continues to be led by a manger with no authority or game strategy. What a mess! Ryota Igarashi was recalled to the Mets Thursday while Rodriguez cools off on the restricted list, expect more roster changes Saturday when the Mets have to decide on a starter to oppose Roy Halladay. Buffalo lefty Pat Misch is a possibility and gained plenty of experience playing for a lousy second-half Mets team last season. His No. 48 jersey has yet to be reassigned. Hi, we’re back with the new setup. I did this mainly because the latest upgrade of the content management system we use wouldn’t support the old layout, but the upgrade also provid ed some small upgrades in capability that make the site better and easier to use. For one thing the lists of yearly numerical rosters now progress sequentially and not in that irritating 1, 11, 12. It also allowed me to bust out Superba Graphics‘ terrific alternate logo and provided an excuse to update the records, links, bios and archives through last year (they’re much better organized, particularly the ancient history, though it’s still a work in progress). Some of the comments on recent stories were cut-and-pasted into the new stories, but everything else is just how it used to be. Big thanks to David Moore at Crooked Number for all the web help. Anyway while this work was going on I kind of slowed down on on the posts right in the middle of what has to be the most interesting spring training, number-wise, we’ve had in a while. A lot of the numbers assigned back in February have gone back up for grabs (3, 22, 32, 36, 43) while guys wearing 76, 78, 79 and 94 have emerged as real threats to take jobs, if not right away then down the road. And more could arrive any minute. Despite all appearances, I still think the Mets will ultimately send Jennry Mejia to the minors, but I’m not one of those pretend scouts threatening to riot if they don’t. People tend to give way too much credit (or blame) to the manager; I think a man will become what he becomes no matter what his address is when he’s 20. Would he keep No. 76? Unusual but so again is he, and the the temptation to subtly suggest he’s one step beyond Francisco Rodriguez might be too powerful to resist. Anyway, that’s just one thing worth keeping an eye on as camp winds down. We’ll rap about more soon! Well, that was pretty swift and anticlimatic, if the reports coming in late this afternoon are true: The Mets have a new closer, Francisco Rodriguez, and their first Uni Controversy of the 2008-09 Offseason. Rodriguez, as you probably all know, favors the same No. 57 on the back of Johan Santana (and, even more famously before him, Jason Roach). 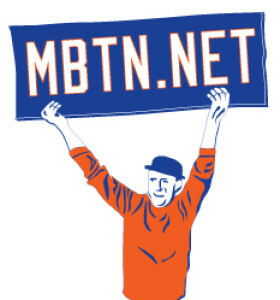 And if the purveyors of Met logo-gear hope to make a few sales in what’s turning out to be The Year Without a Christmas, a swift resolution is in order, so let the speculation begin. The guess here is that Rodriguez winds up in No. 75. His demonstrative body language tells me he’s the kind of guy who likes attention and who wouldn’t easily find comfort in the standard-issue relief gear of say, No. 49 or No. 38, to mention a few of the seemingly available digits (as if the Mets really need another guy to add to their reputation as borderline poor sports and the bane of the opposition). No, this is a guy who’ll demand more, and the Mets will be willing to give. I mean, they let Ricardo Rincon have his 73 last season. Seventy-five is a nice switch on the traditional for Rodriguez, but it will come down to him ultimately. If he wants 97, I think he’ll have that too.